Let’s kick off this post with my favorite joke. What kind of cheese is not yours? Oh man. Hilarious. I really love that joke…Boy can tell you. Any time it comes up, it never fails to make me laugh. Who knows why. Because it’s awesome. That’s why. 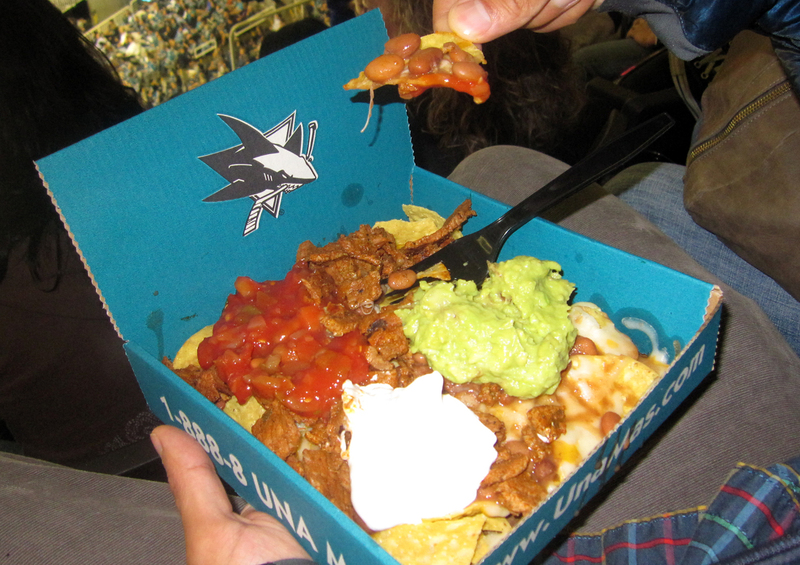 So we decided to make a nacho Toas-Tite but we wanted to make it even more Sharkie. Then a lightening bolt hit. 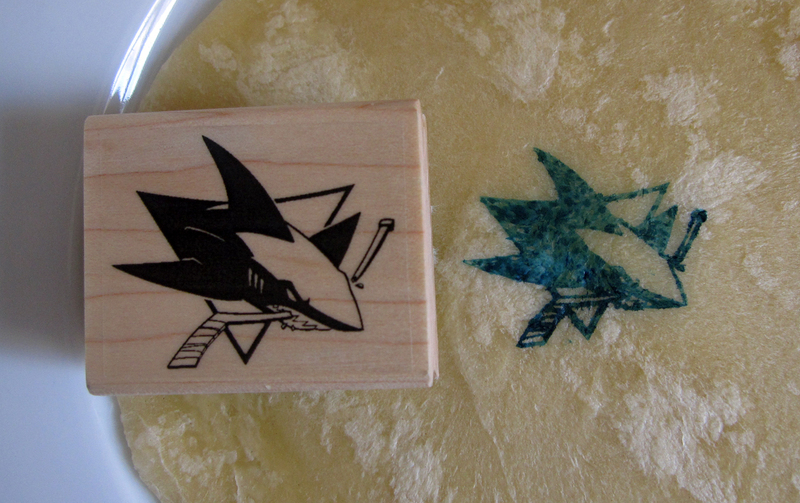 What if we got a custom rubber stamp with the Sharks logo and then stamped our sandwich with food coloring? It was worth a shot! So we got our stamp for the bargain price of $12. Then it was time to get Toas-Titing. To get the stamp to display as best it could, we knew we would need a dense bread for our crust, otherwise the detail of the stamp would be missing. We thought about rolling out white bread but partially to keep the nacho theme going and partially to get a better stamp, we decided to go with flour tortillas. Once we had our “bread” picked, the food coloring came out. The first time we tried the stamp, we put several drops of food coloring onto a plate, dipped it, and stamped. Unfortunately, it didn’t turn out so well. There were droplets of food coloring in the wrong place and in some places, not enough. So we changed our tactic and used a Q-tip to spread food coloring on the stamp. 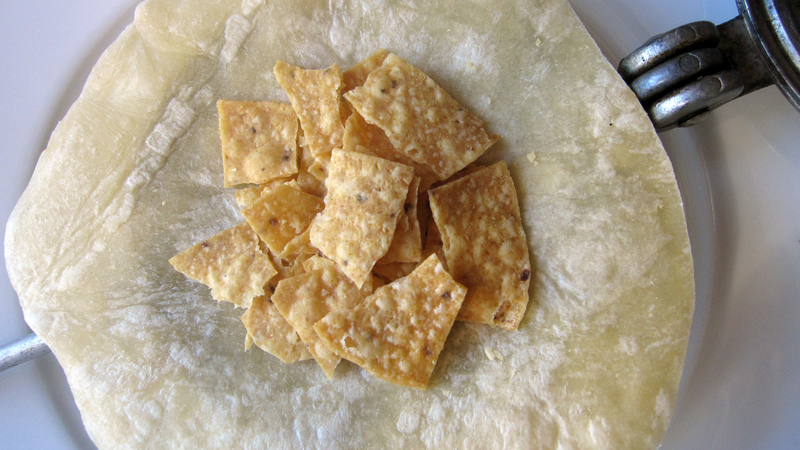 Then we pressed hard on the tortilla that would make one side of our Toas-Tite’s crust. And that time, it worked brilliantly. 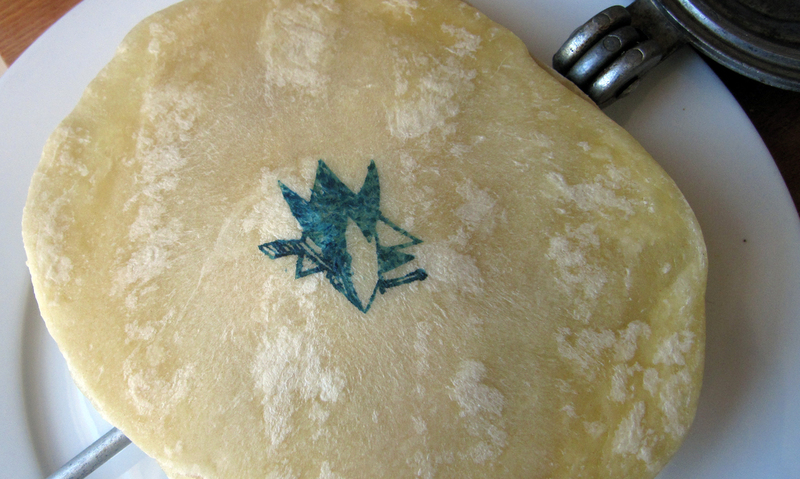 Armed with our Sharkified tortilla, the rest of the recipe was a piece of cake. Spray the inside of your Toas-Tite grill with non-stick spray. Place one tortilla in the Toas-Tite. Add your chips on top of the tortilla. Dollop the nacho cheese on top of that. If you like your flying saucer sandwiches spicy, feel free to add some extra diced chillies or salsa to your mix. With a pastry brush, brush some of the egg around the outside of the tortilla. This will help a good seal between the two tortillas around the outside of the sandwich. Add the other tortilla to the top of the pile, close the grill and trim the excess. Cook for approximately 8 minutes (4 minutes on each side), flipping every 2 minutes, over low heat. If you have added a food coloring stamp to your sandwich, toast for 3 minutes on stamped side to avoid overly grilling your logo. 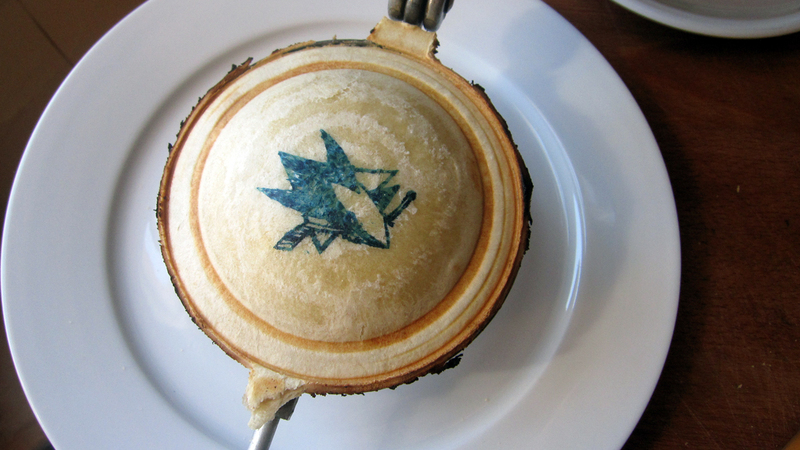 Remove from the grill, revel in the glory of your puck-like sandwich, and eat it up. 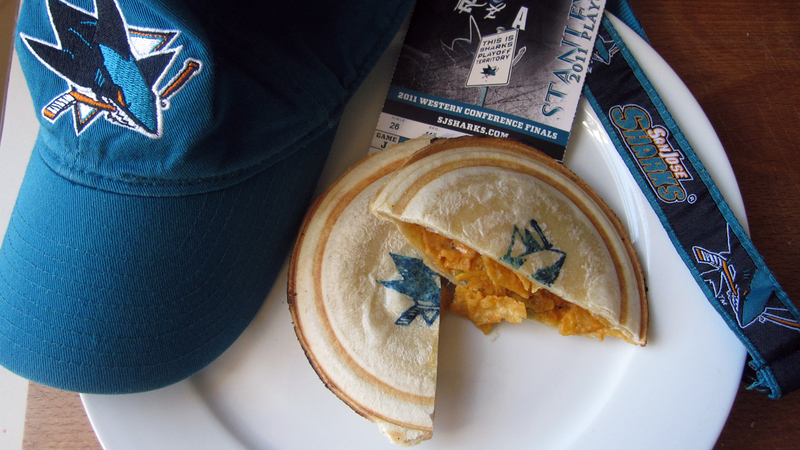 Or….before you eat it, you can get really crazy and gather up your sports-fan paraphernalia and take a sweet picture (and then dig in). Tortillas toast very well in a Toas-Tite grill. While they won’t be as crunchy as a tortilla chip, it’s pretty darn close. However, when using tortillas, keep in mind that they’re not as fluffy as bread and therefore may not naturally seal as well without some extra help. Brushing on a thin layer of egg white or even water around the edge of the sandwich will give that bit of moisture to push the seal in the right direction. 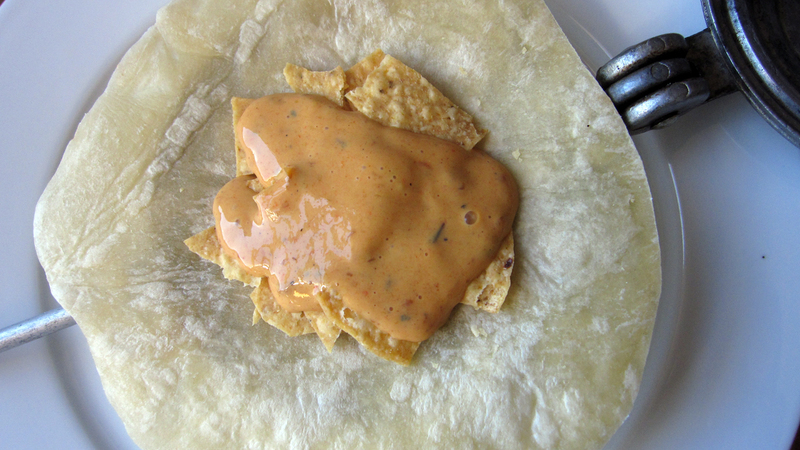 The other critical element to this recipe is the nacho cheese. Not just because nacho cheese is part of a fantastic joke, but because it adds the flavor and the pizzazz to the sandwich. The cheese is really what makes the nacho. We’ve used Toastitos Salsa Con Queso in the past (spiced up with extra salsa) but you can also make your own – we’ve even heard using Velveeta is good. When you’re making this recipe, you can absolutely add other fun nacho toppings – beans, avocado, salsa/pico de gallo, jalapenos, shredded chicken/pork/beef, etc. And you certainly don’t have to stop at one so mix it up and have a few. So get in there, get cheesy, celebrate whatever sports team you cheer for, and enjoy! Ah, Girl and Boy do it again! Another brilliant, awesome and creative Toas-Tite recipe idea. One could even have a stamp made for one’s business or a holiday and use that for a themed event too. What fun! Thanks. I’m here on your site because I just ordered a Toas-Tite and came looking for recipes. First thing to make will be the egg sandwich – it looks great. But I’d really like to know where you had your custom stamp made. This is such a neat idea to make very personalized goodies. And your teal “ink” is just perfect. Very nicely done. PS – I’m local to the South Bay too.